I just got introduced to the cinema of Mani Kaul. And though I have been searching for his movies for five years, I’m glad it happened now. Because only now I have started to understand cinema in a way that is required to react appropriately to such works. Though it’s not more than a beginning, I was glad I could react individually and independently, without being affected by others, including this great article on Kaul’s cinema. Ever since I read the plot of the Rajasthani folk tale on which Amol Palekar’s ‘Paheli’ (2005) was based, I was excited. However, the movie left me disappointed and angry – I thought it was such a waste of a beautiful story. So then I was dying to watch ‘Duvidha’ (1973), the original movie on the eponymous story. I told myself – look at the titles. That alone explains the difference in approach. This story is not about a ‘puzzle’ but about a moral ‘dilemma’. Hence, I was sure ‘Duvidha’ would do justice to it. Today, I watched ‘Duvidha’. And I’m disappointed again. Not that I did not like the movie, but it left so much to be desired. Simply speaking, it failed to explore into the moral dilemma I was so interested in. The husband of a newly wed bride leaves her three days after marriage for a business trip that would not bring him back for five years. A ghost, who is struck by the beauty of the woman, enters the house in the form of the husband, even managing to cheat his own father. But he discloses his identity to the woman and leaves it on her to accept him. Unfortunately, the director does not dwell on the woman’s dilemma, neither focuses on the psychological state of her mind when she agrees to and spends days and nights with the ghost. By using a style, that I would even call egotistical, he solves all conflicts before they emerge. 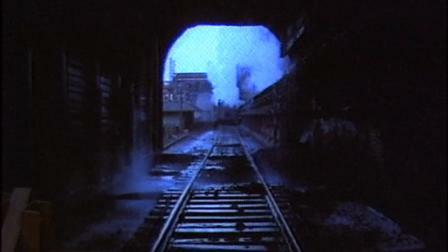 This continues throughout the film – including the conflict that results from the ‘real’ husband’s premature return, and the climax where the ghost is punished. Such a wonderful plot, and such a waste of opportunity. I am aware of the arguments that would come up in defense of the movie. The first would be – the director willingly and consciously decides to sacrifice storytelling to create a powerful personal expression. And the example of Jean-Luc Godard will feature in this argument. Firstly, I think the director is not, or should not be, bigger than the story. And if he wants to showcase a unique and personal style, he should choose the story accordingly. I have watched only seven of Godard’s films, so perhaps I’m not eligible to give a general comment, but none of his movies had a story unsuitable to his style. I never felt Godard is letting go of any wonderful opportunity. I love his playfulness, and I never mind his egotism. Finding the correct story to display your style is essential, as is to find the correct style for your story, which brings me to the second point. The minimalism of Mani Kaul might be compared to Ozu or Bresson. However, the style adopted by these two masters is so suitable to the stories they decide to tell. The economy of expression is so in sync with the universe they operate in. Watching them I never feel that they are compromising on the strengths of their story. I can not help but wonder, what someone like a Jean-Pierre Jeunet would have done to this story – how incredible and memorable the resulting film would have been. The third argument would be the aesthetic excellence of the maker which, and I might be offending many by saying this, I thought was seriously deficient. All these great filmmakers we are talking about had an impeccable craft. Their frames and their montages were very self-assured. I have seen Godard’s outrageous innovations, but generally none of them have weak aesthetics. Mani Kaul’s imagery and sound design could never convince me of his greatness. And the voice-overs further ruined the storytelling. One example would be this: As the villagers are taking the husband and the ghost to the king for a solution, the narrator says that the ghost was on his way to be captured by the shepherd. Till then we do not even know who this shepherd is, and we do not want the narrator to spoil the climax for us. I wonder how would someone defend errors like this. And if you think I’m stressing unnecessarily on the importance of classical storytelling and do not agree with my opinion on Kaul’s aesthetics, please read on. I decided to watch another Mani Kaul movie just after ‘Duvidha’ because I did not want to form an opinion based on just one movie. I decided to spend more time trying to understand something that I might have missed in the first. So I sat for ‘Satah Se Uthta Aadmi’ (1980). It was such a difficult movie, and I was so hungry, that I repeatedly considered the option of leaving it mid-way. There was obviously no story, and the loosely connected episodes made no sense at all. But I persisted. I wanted to give the maker a fair chance. And thank God I did that. As the movie approached its conclusion, everything started making sense to me. The movie was pure poetry – a long poem that uses abstractions to convey the world-view of the poet. The lack of coherence and the vague imagery was completely in sync with the content (or the story). And hence, I liked the movie more than the first one. I would like to insist, thus, that I’m not adamant about the classical structure of storytelling. I only believe that the story should dictate its style. However, even this movie left me unfulfilled as far as the aesthetics were concerned. Watch Tarkovsky’s ‘The Mirror’ (1975) – another film-poem and you would agree. If ‘Duvidha’ and ‘Satah Se Uthta Aadmi’ could only improve on their shots and edit, without changing the style, the mood, or anything else, these would have been much better movies. And the argument that I should not compare Mani Kaul with Andrei Tarkovsky is totally irrelevant. Because if you are calling him great with respect to Indian cinema, we have no argument at all. Just two movies, and I’m convinced of Mani Kaul’s greatness. The sheer conviction to make such movies, in such a style, in our film-industry, during that period is enough to convince me of that. I would definitely watch more of him, and would love to accept later, if it happens, that I was too quick in forming an opinion about him. But my belief on two things just got strengthened today. The first is really unfortunate and harsh, that even the best of Hindi cinema stands nowhere compared to the best of the world. And the second, that the story, within or without a coherent narrative, is above the style of the film and more importantly, the filmmaker. from where did you get mani kaul's movies? how can i get it from you? do write urgently. DHRUPAD on Youtube, DUVIDHA on Rapidshare, NAZAR on Jaman, SIDDHESHWARI on The Pirate Bay, and the rest on torrent sites. thank you sir at last I was able to download Siddheshwari. Where can one find Uski Roti? 2. Aesthetics of Tarkovsky: Since "Mirror" movie is referred to; I assume a visually poetic shots are being referred to..... While Robert Bresson had a different view of this ...from his interview(https://www.youtube.com/watch?v=NSo8xcXlr1Y at 17:33) ..